The Arleigh-Burke class guided-missile destroyer USS John Paul Jones (DDG 53) launches a Standard Missile-6 (SM-6) during a live-fire test of the ship’s aegis weapons system on June 19, 2014. US Navy photo. The Navy’s surface ship weapons office is developing software to bring additional mission sets to the Standard Missile-6 surface-to-air missile, which may be ready for fielding in the next year or two. Capt. Michael Ladner, program manager of the surface ship weapons office in the Program Executive Office for Integrated Warfare Systems (PEO IWS 3.0), told USNI News that there are several new missions that could be added to SM-6 – beyond its advertised capability of air defense against manned and unmanned aircraft and cruise missiles – through software-only upgrades. “Our focus in IWS 3.0, in surface ship weapons, has been, how do we go find opportunities to take advantage of existing capability in the missiles above and beyond what they were initially required to go do, to see if we could provide an affordable capability faster to the fleet by taking advantage again of the capabilities already in the missiles [and adding] those new mission sets,” he said in an Oct. 26 interview. The first batch of new mission sets would be incorporated into the SM-6 production via an engineering change proposal, Ladner said. Future missions could be added on separately if needed, but he said he’s eyeing a few now that could be developed and tested within a year or two. The software for each new mission would go through rigorous testing – hundreds of thousands of runs using modeling and simulation, plus land-based testing, lab analysis and ultimately flight test demonstrations. “That’s a lot of effort that we’re trying to do quickly,” Ladner said. And thanks to an effort started more than a decade ago, backfitting existing missiles with the new software could take just a matter of months instead of years. When the SM-6 program began in 2004, the program office decided to simultaneously pursue a reprogramming capability for the missiles. The Common Munitions Built-in Test (BIT) Reprogramming Equipment (CMBRE) capability would allow Ladner’s office to take the new software and rapidly install it in the missiles already in the fleet. And if new mission requirements came down from the chief of naval operations, the whole process is repeatable. Ladner said the limiting factor is the computing infrastructure on the missile. His office is working with Standard Missile manufacturer Raytheon, academia and Navy warfare centers to fully understand how much margin there is to exploit, though he said that at some point the Navy would likely need to put new computer chips on the missiles for obsolescence management or as a planned processor improvement project – and those new chips would have greater capabilities and allow for even more software upgrades in the future. 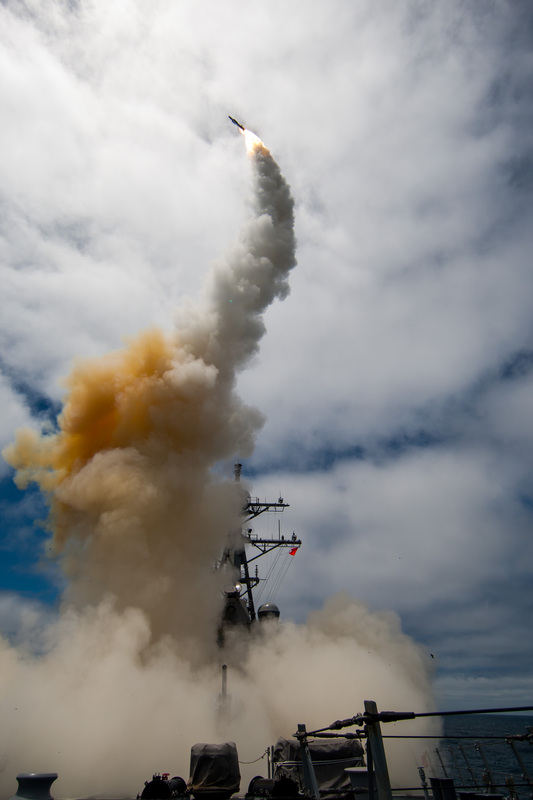 Ladner said the SM-6 program wouldn’t be a catch-all for all surface-launched missile needs but could prove both useful and cost-efficient for the Navy. “If I can take advantage of fielding capability faster with existing inventory, I think that’s a great benefit to the Navy,” he said. The SM-6 program reached initial operational capability about a year ago and has already delivered about 200 rounds to the fleet out of a total program of record of 1,800. Ladner said those missiles can be used on legacy Aegis Combat System baselines, or about 75 percent of the ships deployed today. He is working with the Aegis program office to test SM-6 on the new Aegis Baseline 9 and has completed six of the 19 flight tests required. After completing the remaining tests – hopefully in about six months, he said – SM-6 will be able to be fired from all cruisers and destroyers in the U.S. Navy fleet. Ladner is also hoping to see the SM-6 deployed internationally. He said about six countries are actively interested in the missile and are seeking more information, though none have formally opened a Foreign Military Sales case yet. “We’ve received several request for information and availability,” Ladner said.